American late-night TV hosts dusted down a few British stereotypes as they mocked the Brexit chaos yesterday. 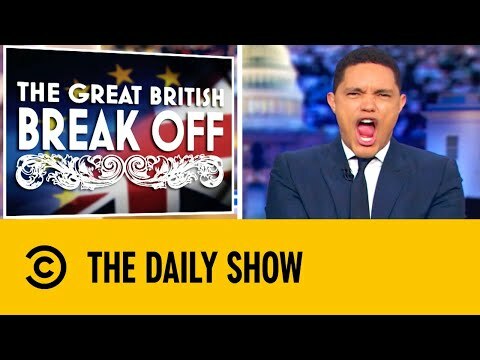 Comedy Central’s Daily Show called it ‘The Great British Break Off’ and used the impression that all Brits speak in whimsical archaic language to make its points. ‘Prove me wrong,’ he then challenged his audience. The segment also included footage of two Welshmen having a dispute over figures of speech, and concluded with Noah talking about possible food shortages post-Brexit and joking: ‘Africa’s watching all of this going “Who’s laughing now? However James Corden, who might be best placed to comment on the situation in the UK, ignored the story altogether during his monologue, as did Jimmy Fallon on The Tonight Show.